that would be us in the little boat, cheers to John Flano for the photo. Doc and his friends were very welcoming to Nate and I, and made sure we saw a side of Nha Trang that the common visitor wouldn’t typically see. We ate a few times with him at Local Restaurant where we met the owner, Son. From a small village a few hours from Nha Trang, Son graduated from university and had trouble finding a job. He got a job in a restuarant and starting learning all over again, “Not for the money,” he says. Years later, after managing one of the most regarded establishments in Nha Trang, The Sailing Club, he opened his own restaurant, Local, which is now popular with ex-pats and Vietnamese locals alike. On one of our many days in Nha Trang, a whole gang of us, all pulled together by Doc and lead by Son, gathered at the Local and hopped on motorbikes to Bai Dai, or Long Beach. The ride, hugging the coast, was stunning and took about 45 minutes. 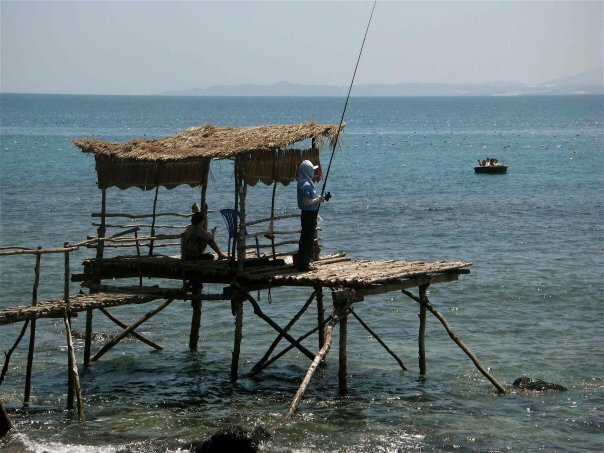 Instead of heading straight to the white sands of Bai Dai, we stopped at a little fishing spot just a few minutes away. This is where Nate and I got to do maybe the coolest thing we’ve done so far in Vietnam: fish from a basket boat. Son and his friend Da took us out in the little basket boat to catch sardines. I caught the first one, Nate the second, and Son just about every one after that. The sun was high in the sky, as we got a late start, and we were impressed to have caught anything. A few of us then rode over to Bai Dai where we swam, relaxed in hammocks and beach chairs, and nibbled on a seafood hot pot. Hot pot is probably my favorite meal in Vietnam. The table is served a large bowl of spiced water over an open flame on your table. Then you add your choice of raw seafood (usually some combo of crab, squid, shrimp and fish) and vegetables then let them cook in the boiling water. Then everyone is served cups of the tasty concoction. The beach we were on is great as it’s little known to most western tourists, and practically deserted during the week. While we were out, Son and Ha caught some more fish and he and his family prepared them, allowing us to return to an absolute feast. I think eating the fish may have been more fun than catching them. The sardines are grilled whole. Then you peel off the skin (or we did at least) before peeling back a “fillet” from either side. What’s left is a skeleton of a fish that reminds me of a cartoon: think Sylvester putting a whole fish in his mouth and pulling out only bones. The day was great. New friends, beautiful scenery, delicious food. Meeting people who live where you’re visiting often leads to the best experiences.